If your doctor has requested that you participate in a sleep study, you may be wondering what exactly you are signing up for. This test, which most commonly refers to a polysomnogram, is a painless way for your doctor to see what it happening while you sleep. It is an important tool for diagnosing sleep disorders and can also used to gauge the effectiveness of sleep disorder treatments. 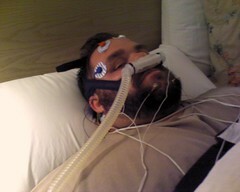 Sleep studies can be performed in the hospital or a sleep lab and are non-invasive. Most studies involve spending a night or two sleeping at the testing facility with sensors attached to various points on your body that measure and record things like your heart rate, eye movement, and brain activity while you are sleeping. Generally, if someone refers to a sleep study, they are talking about a polysomnogram, but there are other types of sleep studies used to diagnose and treat sleep disorders. According to the National Blood and Lung Institute within the National Institutes of Health, these are the four of the most commonly used sleep studies and what you can expect during each test. This test is performed during an overnight stay at a sleep center and records brain activity, eye movement, heart rate, and blood pressure. In addition, this test captures information specific to how you are breathing including how much oxygen is in your blood, the amount of air moving through your nose, the movements of your chest, and whether or not you snore. The polysomnogram is often the first sleep study performed and is used to diagnose a variety of sleep disorders including sleep apnea. The test starts with the attachment of electrodes on your scalp, face, chest, limbs, and one finger. These electrodes contain small sensors that record the various pieces of information that are tracked during the study. Elastic belts will also be placed around both your chest and abdomen to monitor and measure your breathing and the movements of your chest. All these sensors have wires attached to them that send the information about you to the sleep center’s computer over the course of the study. It may seem like all this equipment will make it difficult to sleep comfortably, but few people actually experience difficulties sleeping. This test is performed during the day and is generally done as a follow-up to a polysomnogram. It measures daytime sleepiness and is performed four or five times over the course of a single day. The actual testing takes about 30 minutes each time. Your brain activity is monitored during the test and if you fall asleep, the type of sleep you experience is recorded. This test is useful for diagnosing narcolepsy and some of the hypersomnias. While this test also requires the use of electrodes, there are fewer than with a polysomnogram. Within a few hours of waking up from your polysomnogram, you will be asked to relax in a quiet room while measurements are taken. Each test will take about 30 minutes and will be followed by a 2 hour break during which you will have to remain awake. This test is also performed during the day and gauges your ability to remain awake and alert. Like the MSLT, it is often performed the day after a polysomnogram and can take almost the whole day. While the MSLT measures whether or not you fall asleep, this test asks you to try and stay awake throughout the testing period. During the test, you will be required to sit still and stare straight ahead. Each period lasts about 40 minutes and requires that you be connected to tracking sensors. The test is repeated four times over the course of the day and each test period is separated by a 2 hour break. This test measures only some things that a polysomnogram measures and can only be used to diagnose sleep apnea. Instead of spending the night at a sleep center, you perform the test at home. Testing equipment and instructions for using the equipment and performing the testing are provided by your doctor or at a sleep center. Once you have completed your sleep study, it may take a few days to get the results. Your doctor or sleep specialist will walk through the results with you, explain any next steps, and answer any questions you have about the testing.